Try. Fail. Try. Succeed. Repeat. Thrive. It was also payday, but I’ll spare you the horror stories of the commissary on payday, for now. Anyway, I have this recipe, if you will, for “The Refrigerator is Empty” grocery days that helps ensure that we eat a variety of meats and that we eat fresh seafood regularly without breaking the bank. First, I hit the seafood counter to see what they have to offer. If they have fresh VA oysters I always grab a dozen. I’m the only one who eats them, but since they’re local we get them for a great price, and how can I pass up that much vitamin B12 goodness? I also pick up something for dinner that night. This is generally fish of some kind, though occasionally we’ll do crab or lobster if it’s on sale. Is it a product of the U.S.? What is the price per pound compared to other offerings? I want whatever I choose to meet those requirements as closely as possible. So, for instance, the croaker and oysters I picked up yesterday were fresh, caught less than 50 miles from here, and very affordable, so they met all of my requirements with flying colors and I picked up enough for two meals. However, in the winter the local seafood industry dies down and my best bet is usually previously frozen, wild, Alaskan salmon or previously frozen, wild, Alaskan snow crab. These are definitely on the more expensive side of things, so I try to find them on sale and only buy enough for one meal. Once I’m done with the seafood counter I move on to the land animals. I always purchase beef, pork, and chicken. This is that “ensuring variety” I talked about earlier. I tend to do roasts and whole chickens since that is where I can get the best price per pound. I know I can cook the cheapest roast up into a delicious dinner, and I’m not afraid of chicken innards. Also, our commissary carries an organic, grass-fed ground beef (sometimes) so I will stock up on that when I find it. Since that is the only grass-fed meat that I have affordable access to, I can justify splurging a little and buying enough to last a month or so if we eat it once or twice a week. I’m also trying out buying packages of chicken legs, and baking them alongside what ever I’m making for dinner, for an easy lunch protein. At the end of this I have enough meat in my cart to make cashiers look at me funny, and to ensure that I don’t have to worry about buying more for about two weeks or so, making subsequent trips to the commissary that much easier. It also means that we shouldn’t end up burned out on one kind of meat because I got stuck in a rut and we ate just that one kind for a month. Now that I’ve subjected you to the intricacies of my “shopping for meat at the commissary” routine, I should probably share the recipe (I use that term loosely) that prompted this post in the first place. Do you remember the croaker I mentioned I picked up yesterday? That’s them right before they went into the oven, but we’ll back up a minute so I can tell you how they got that way. This was our first time having croaker, so naturally there was some Googling involved in trying to decide how to cook it. Most of the sites I found said to fry it (too messy, time-consuming, there’s gluten involved, etc. not happening) or to use it as bait for flounder (also not happening since I paid for them and not at a bait shop). Okay, so, it was time to put my cognitive skills to work since my Google-fu had failed me. What I had in front of me was essentially six smallish fish, gutted, with the heads on. Okay, how do you cook whole fish? And what goes well with fish, that I have on hand and can stuff into that tiny cavity? Coat with olive oil, salt, and pepper inside and out. Stuff each with 1/8 lemon wedge, 1 smashed garlic clove, and about 1 tbsp minced onion. Sprinkle more minced onion on top, and garnish with slices of left over lemon. Bake in a 400 degree oven for 30 minutes. I had no actual idea how this was going to turn out, but I was pretty sure the foundation was sound, so I went for it. I have decided to do my best to minimize carbs for myself (no more relying on the oh-so-easy potato anymore) so I decided to pair this with a recipe for roasted cabbage I had seen. 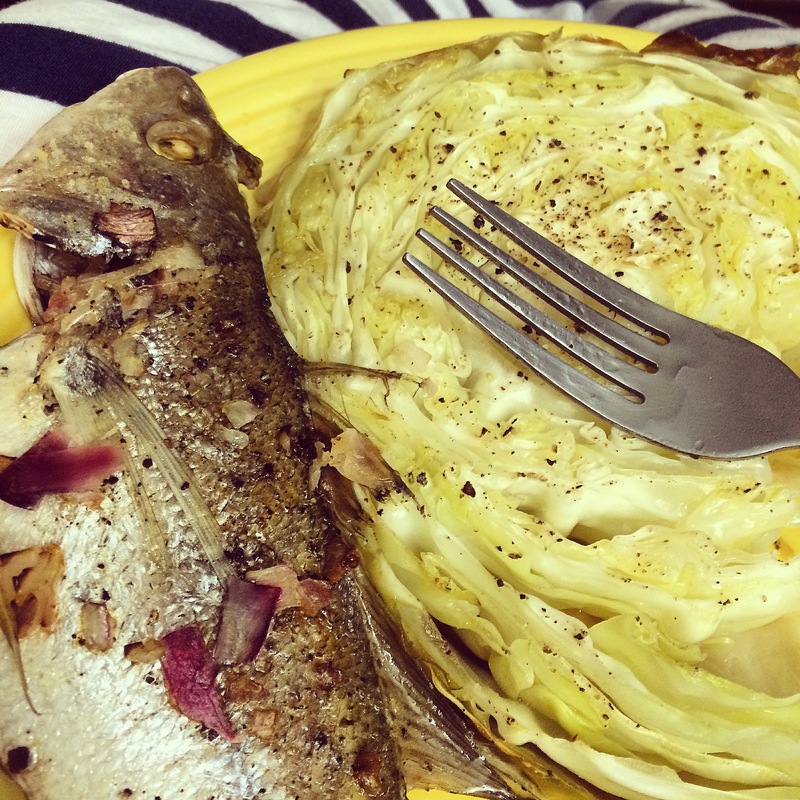 I was inspired by: Lemon & Garlic, Roasted Cabbage Wedges by did someone say CHOCOLATE? I, however, did not have anymore lemons and I had never had garlic paste. I didn’t feel like to slicing/mincing/super-smashing my own garlic at this point in the game, either. So, I left them out. Hack off bottom stem thingy that holds everything together. Discard outermost leaves that are bruised or too loose. Be careful, cabbage is dense and mine resisted easy slicing. Pay attention and watch your finger placement! Again, remove any leaves that insist on falling off of their respective rounds. Place on foil lined, olive oil greased baking sheet. Coat each round generously with olive oil, salt, and pepper. Turn over and repeat #7 on the other side. The cabbage is not going to be bothered by a few more minutes in the oven, and if you prefer your cabbage soft rather than crunchy you may want to cook it for about 45 minutes. Just remember that the smaller rounds are going to cook faster than the larger, denser rounds. This is what mine looked like once everything was done and plated. It really was quite appealing. Moist, with a nice balance of fish and flavors. It is a bony fish, though, so watch out for small bones as there are a lot of them. The cabbage was crunchy and tender at the same time. Sweet, not bitter. The largest round could probably have been two servings had I been so inclined. I don’t think anyone is going to fuss at me for gorging myself on vegetables though. All in all, this was definitely a success. 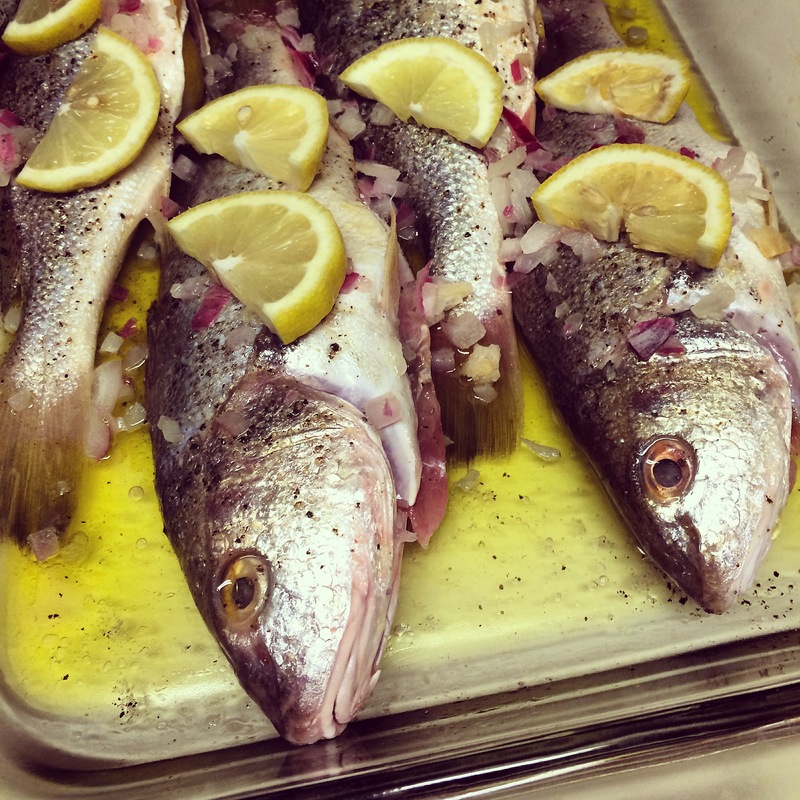 I will be repeating this recipe (probably with a tweak here or there) whenever I have fresh, whole fish to cook with. I will also definitely be remembering to bring onion, garlic, olive oil and lemons with me when we go camping since this would be a beautiful way to cook up some freshly caught anything. Introducing Paleo and CrossFit to a Knitters' life.